What does the Valentia Even Glow Vitamin C Face Serum do? This powerful anti-aging serum with 20% vitamin C evens out your skin tone, reduces aged spots, boosts collagen production and minimizes fine lines and wrinkles. Your skin is left super hydrated and velvety soft and looks younger, fresher and more vibrant. This vitamin C serum is also useful for healing acne scars, because it contains green tea (a potent antioxidant that promotes cellular renewal and fades skin discolorations) and buckthorn oil (which has super healing properties and helps to fade acne scars). Who should use the Valentia Vitamin C Face Serum? If you want to rejuvenate your skin, reduce fine lines and wrinkles and give your complexion a younger and healthier glow then this vitamin c facial serum should be in your daily beauty routine. How do you use this Vitamin C Facial Serum? Shake the bottle for 1 to 2 seconds before use, then once you have cleansed your face and neck, pat your skin dry and apply a small amount of the serum to your skin. Allow to absorb into your skin before applying moisturizer or makeup. Use daily. Made in the USA and does not contain perfumes, alcohol or parabens and it is cruelty free. This serum also contains a clinical strength 20 vitamin C.
Vitamin C is a super antioxidant that helps us fight the signs of aging caused by free radical damage. It is also essential in cellular repair, promotes the production of collagen, and reduces uneven skin tone and age spots and helps to minimize fine lines and wrinkles. Your skin is left firmer and suppler and looks more vibrant and refreshed. Hyaluronic acid is a potent hydrator and can absorb more than 1000 times its own wight in water. It deeply penetrates your skin, taking the moisture right down to where it is needed. Hyaluronic acid also helps other important ingredients to penetrate your skin, giving your skin a deep pulse of moisture and nourishment. 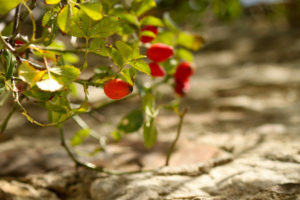 Rosehip oil is full of antioxidants, Omega 3, 6 and 9 and vitamin A. The oil is a rich amber colour which comes from lycopene, a strong antioxidant that helps to fight the signs of free radical damage in our skin. The essential fatty acids (Omega 3, 6 and 9) aid in cellular repair and rejuvenation and so help to reverse the signs of sun damage, dry skin and wrinkles. Rosehip oil is a really old remedy, used by the Aztecs for its super healing properties and the fact that it nourishes and moisturizes the skin so well. Green tea is an even stronger antioxidant than vitamin C and helps to reverse the signs of aging caused by free radicals and the sun. It minimizes aged spots on your skin, encourages skin renewal and repair and gives your skin a brighter and more refreshed appearance. These plant stem cells are produced from plant cell cultures and so far, I can’t find out how they work. They are said to aid in the reduction of toxins in the skin, in extending the life of cells and in cellular regeneration. Apparently it activates your skin’s defense systems and causes your skin to work harder to fight the signs of aging. Your skin looks more radiant, younger and refreshed. This oil comes from a shrub that grows in Asia and Europe. It has long been used for its wound healing properties as well as its skin nourishing properties. It helps in healing burns, rashes and open wounds and assists in reversing the signs of aging, caused by free radicals. It contains vitamin C, E, B12 and A, as well as Omega 3, 6, 9 and 7 (which is unusual for a plant). It is a potent oil for your face, as its antioxidant, anti-inflammatory and skin healing properties help to nourish and rejuvenate your skin’s cells. 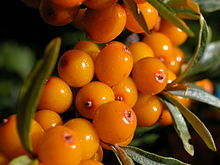 Sea Buckthorn oil helps to rehydrate your skin, improve its elasticity and is also beneficial in treating acne. PROS: Of all the customer reviews, 94.3% gave this vitamin C facial serum a 4 or 5 star rating. Customers commented that they found a great improvement in scarring and redness on the skin, that it smells nice and citrusy, it is a light weight serum, not sticky or clogging their pores and their skin feels smoother and looks brighter. CONS: Only a few customer reviewers gave this vitamin C face serum a one star rating. Negative comments concerned receiving the wrong product, that they saw no difference in their skin or that their skin broke out after using this serum. This product is amazing!!!!! I love how it made my skin appear softer and plumper, and how it helped my mylasmia! Great product, this is the second time I have ordered it. This is a wonderful product for wrinkles and healthy looking skin. After a couple of weeks of usage, my skin looks smoother, more radiant and even more glowing. My skin looks healthier and feels it too. My boyfriend even complimented me that my skin tone looked even. This feels AHHH-MAZING on your skin….and smells good too! The packaging looks great, it is not too sticky and customers say that it lasts a long time. It also has a lifetime guarantee, so from this I assume that if you decide you don’t like this serum, even if the bottle is empty – that they will refund your money. Read more Vitamin C reviews here.